Last night, halfway through my second dishcloth for knitting class, I said “screw it; I’m done with this thing.” Not with knitting itself, mind you, but the stupid dishcloth. The small cotton yarn had no give, no interesting texture and grated my fingertips. Also, we have a dishwasher; I don’t need more than one or two dishcloths, and I already have more than enough. Flipping through cowl and scarf patterns on Ravelry, I found a cowl and a scarf which both looked easy enough. 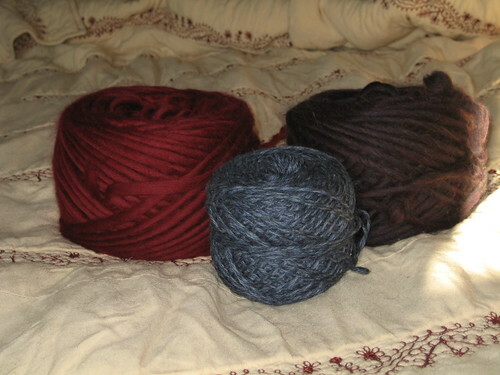 The cowl required super-chunky yarn, so off to Threadbear I went. I went to the register, asked them what they’d recommend for each project. Sadly, they had nothing resembling what I’d need for the scarf, but had plenty of choices for the cowl. I picked two skeins of Cascade Magnum. Now, when I hear “Magnum,” I think handguns or condoms, maybe wine; yarn does not come stampeding to mind, right? But this stuff is bloody huge! If ever a yarn qualified to be a “magnum,” this is it. 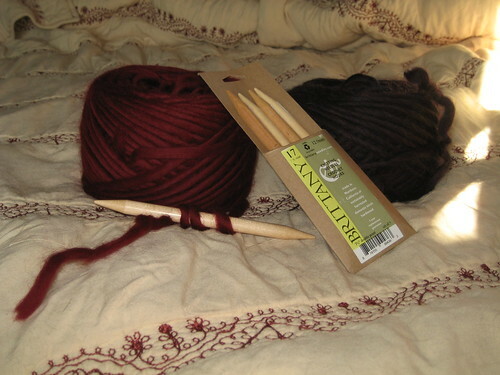 I then asked about 16-gauge circular needles. They had a set, but it was only 16 inches long… not going to work for 48 stitches of this stuff. I decided to go with a set of size 17 double-points – eek. I have no idea how to use these things, but there has to be a video somewhere. The set was three times cheaper than the Addy Turbo whatevers in the circular style, so that’s a good thing. And there are five of them… which is… confusing. After making my purchase, I went back to the ball winder – the Swift – to package this delectable stuff into usable balls. I thought I remembered the basics and managed to awkwardly load the first skein on, and began to wind it. It fought me every round, tangling, and I finally unloaded it, got it completely bollocksed up and went over to Rob, the owner, with a desperate look in my eye. “I’m being outsmarted by my yarn,” I wailed. 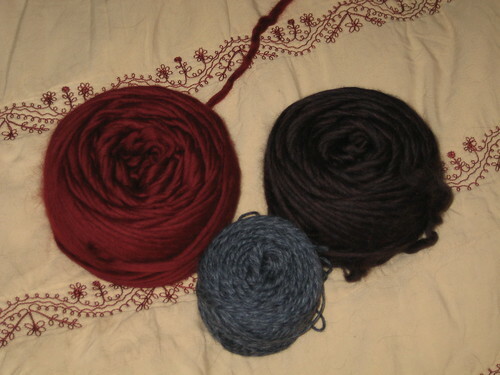 I was much more careful with the second skein. It took me a good 5 minutes to get it into a complete state of disarray that time. Some of the ladies at a nearby table noticed my dilemma and summoned Sabrina to help me. “Never take the band off before you load it, ever ever ever.” She got me fixed quickly and we had an absolutely giant ball in seconds. I went back over to stand awkwardly at Rob’s side, as he patiently untangled the rat’s nest I had handed him. Rob is a phenomenal knitter. Thursday night, he casually walked up to my novice group, madly knitting something fairly fine in the round – and he wasn’t looking at his hands. He was frenetically knitting this whatever, walking, talking, and making about three stitches per second. We were all appropriately floored. 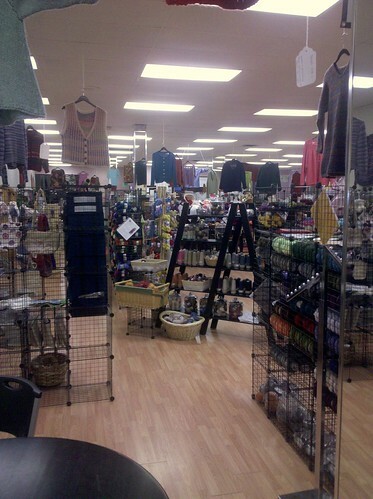 He’s the guy people come in with knitting emergencies and beseech to fix their beloved projects – and he does. I feel good helping him pay a small portion of his electric bill. Not good enough to buy the $27 brass-coated Addy Turbo needles, mind you, but still good. If I wanted to expend the effort to hang out here and get to know people, I suspect I’d find a warm and willing group… but I’m just not entirely sure about that yet. The class, with only 5 other women, is mentally taxing – not due to learning new stuff, but to all the smalltalk with people whom I don’t know. I’ve never been any good at it, and it’s partly why I avoid going to a hair stylist at nearly any cost. Still, once I got to know some folks, learned a little about them, it might be okay. Rob finished unratting my nest without a single complaint and handed it to me. I thanked him profusely and he was off to another task. 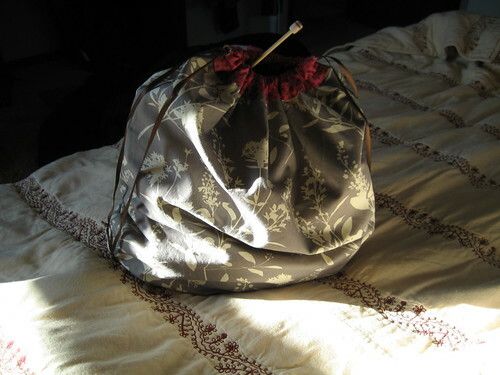 I looked at the enormous wads of gorgeous yarn and realized it’s a damn good thing I made that bag as big as I did! These wouldn’t have fit into anything smaller. I guess I just cast 16 stitches onto each needle and hope? But what keeps them from flopping apart? Oh YouTube, help me! If you have trouble, I could try to talk you through it. Love the colors! I seem to recall, somewhere in the foggy corners of my mind, having some sort of rubber thingy that went on the open ends of the needles that weren’t being knitted with? It’s been 20 years since I did any serious knitting, so I could be just making that up. 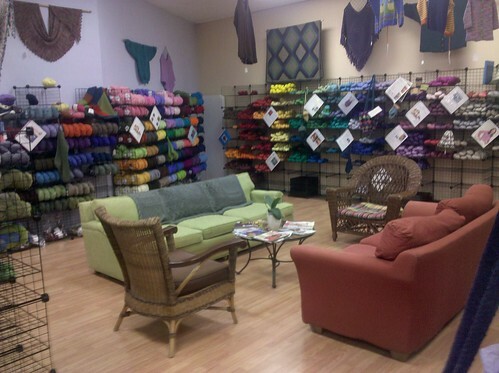 That yarn store looks brilliant and your knitting bag is beautiful. Great work!